Bundled up for the cold, dozens of runners and walkers take off in the 2018 Community Hospital Turkey Trot Saturday morning. The annual 3.1-mile event featured plenty of colorful costumes and prizes. McCOOK, Neb. — Not the chance of snow, not the cold wind blowing out of the north, not the temperatures struggling to break the freezing mark. Nothing could keep the hardy group of runners and walkers from tackling the 3.1 miles at Saturday’s Turkey Trot in McCook, sponsored by Community Hospital. The event included hot chocolate and apple cider waiting at the finish line, cash prizes for the best costumes and Thanksgiving-themed jokes along the route to distract the runners and walkers from the less than ideal weather conditions. McCook High School cross-country stand-out Elsi Rodewald led the entire pack with a time of 21.37, claiming overall winner and the women’s 19 and under title. Rodewald won a Class B Top 10 medal at he Nebraska State Championship Meet in Kearney one month ago today (Oct. 19). Leading the men’s division was Ben Ratliff of North Platte with a time of 22.27. 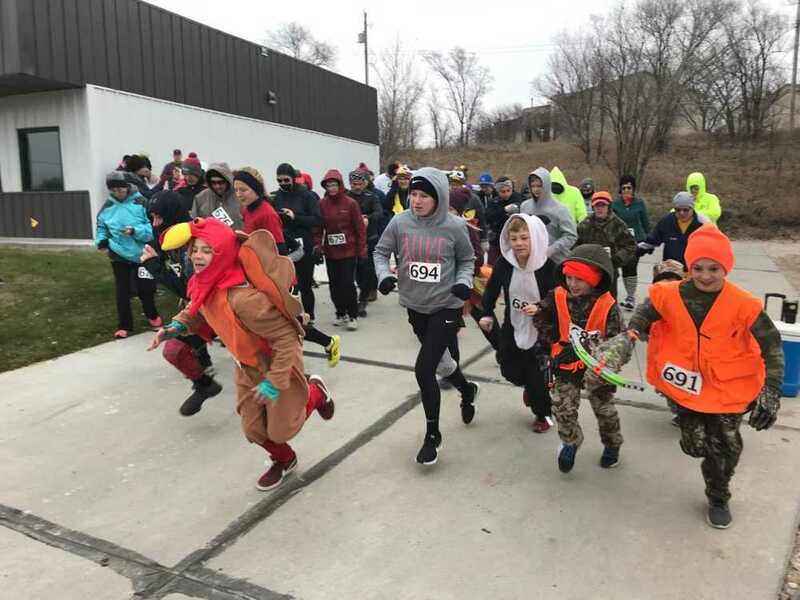 The 2018 Turkey Trot also awarded cash prizes to the top three costumes, which were the Staci Blomstedt family as turkey hunters complete with a blind and turkey, Dannette Kloepping who turned her legs into “drumsticks” thanks to a lot of stuffing and Karleigh Thorpe, with her own rendition of a turkey. The Turkey Trot is the 10th of 11 events in the Republican River Fitness Series which is a collaboration of the McCook YMCA and Community Hospital. The final race of the 2018 series is the Reindeer Run on Saturday, Dec. 15 at Barnett Park. The cross-country style race begins at 11 a.m. with race-day signup at 10 a.m. in the west shelter house.